The quintessential hunting, service and family dog, the Labrador retriever has been the most popular dog in the United States since 1991, according to AKC registration statistics. It’s also the most registered breed of dog in Australia, Canada, New Zealand and the United Kingdom. The affable and even-tempered Labrador is an intelligent dog that’s quick to mature – in the sense that it can begin advanced training and understand concepts at a fairly young age – and willing to please its owner. Originating on the island of Newfoundland in Canada, modern-day Labs descend from a now-extinct breed known as the St. John’s water dog; similar to but smaller and with shorter hair than the Newfoundland breed of dog. St. John’s water dogs were used by fishermen to retrieve nets and haul lines between vessels, as well as for waterfowl hunting. The dogs were brought back to Poole, England, then a hub of new-world fishing and were developed into the modern Labrador. They were then returned to North America and have been a mainstay ever since. Medium to large in size, weighing between 60 and 80 pounds on average, Labs should have a broad, somewhat blocky head with hazel or brown eyes depending upon coat color. Their short double coat, which repels water and insulates them when retrieving in icy waters, comes in three standard colors: black, yellow and chocolate (or brown). There are shades within the yellow color (ranging from “fox” red to a pale cream). Chocolate Labs are usually a deep, dark brown color. Puppies in all three colors can potentially come from the same litter. Like most breeds that have attained success in service or field work, and then popularity with general society and the conformation ring, the Labrador breed has a definitive split between show/conformation lines and working/field lines. Generally speaking, conformation lines (often referred to as “English,” “show” or “bench”) have broader heads, shorter legs and body, and are heavier, more substantial dogs with thicker coats. Many of them would have a difficult time performing a day’s work in the field because of their physical construction and because their prey drive has often been reduced through selective breeding. Field lines (often referred to as “American” or “working”) tend to be leaner with more athletic bodies and longer legs, which aides them when working upland fields and hunting waterfowl. Their higher prey drive is necessary for the advanced training and rigors faced in the field. 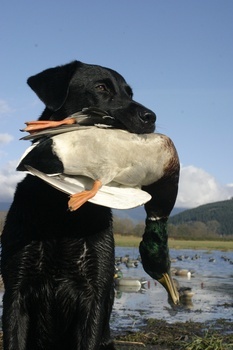 The accommodating, loyal and willing-to-please demeanor of the breed combined with their intelligence, athletic construction and superb nose makes Labs suitable for just about any endeavor – from hunting (both as upland and waterfowl retrievers) to service work (as seeing-eye dogs; detection and tracking for police/military) and more (including as alert dog for diabetics). Owners can also participate in a range of activities with them: therapy dogs in hospitals, agility and obedience trials, hunting trials and tests, conformation competitions and as search-and-rescue teams. As medium-to-large-sized dogs, Labs enjoy a lifespan of 10 to 12 years. They do suffer from a variety of issues, including hip and elbow dysplasia, bloat and a range of genetic issues. Likely a result of their popularity more than anything, more genetic mutations have been identified in Labs than any other breed. At Paw Print Genetics, we offer a Labrador retriever panel test that screens for all 12 known mutations in the breed. Included in those tests are some of the biggest concerns for Labrador owners, including exercise-induced collapse, degenerative myelopathy, centronuclear myopathy and two types of progressive retinal atrophy. As part of the breed of the week, Paw Print Genetics is running a special: you can receive 15-percent off three or more test by using the code FBLAB at checkout, or you can receive 25-percent off the cost of a panel – the best investment you can make in your Labrador – by using the code FBLABP at checkout.